Will we see you at the world's largest lean conference, the AME Annual Conference, this October? Once again we'll be hosting a networking cocktail party. More information. In response to several requests we have recenly launched Gemba Academy Consulting Group to provide on-site consulting and training. More information below. 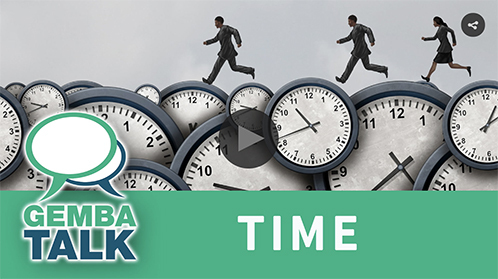 We just released the third video in our Gemba Talk series, where we respond to questions from customers. The topic this time is... time. Gemba Talk videos do not require registration. Raye Wentworth of New Balance shares the details of their lean journey. Kevin explains the true value of lean. Md discusses his background and the process of getting his Six Sigma Black Belt through Gemba Academy. Jon explains the difference between solving problems the traditional way and using a continuous improvement mindset. Kevin shares the important lessons he learned while working at a 24/7 manufacturing facility. Ron compares a harrowing experience abroad to practicing Toyota Kata. Steve shares one of the common barriers to improvement. Did you know that Gemba Academy also supports clients on-site at the gemba? We launched Gemba Academy as an online learning platform in 2009, based on our deep experience in continuous improvement consulting. We have guided and supported many customers. Because of growing requests over the past few years, we are expanding our on-site support services to include classroom training, on-site consulting and coaching. Learn more. This month we are introducing a pair of Toyota Kata workshops.
. Identify your constraints and use them to drive improvement. As Ron says in several Gemba Academy videos, "Use your wits over your wallet." As others like to say, "Use creativity over capital." If you have questions about your next improvement or would like an outside perspective, schedule a call with us here. Upcoming events that you might be interested in. This year's AME conference, the largest lean conference in the world, will be in San Diego the last week of October. Once again we'll be hosting a networking cocktail party (with no sales pitch!) on Tuesday evening, October 30th. Use discount code GEMBA10 to save 10% on the conference registration! Subscribe online and gain access to videos, quizzes and downloadable content — over 200 hours worth of training material. © 2009-2018 Gemba Academy LLC. All rights reserved.